The stage is set for the next big GOP showdown in Milwaukee, Wisconsin, on Nov. 10, but the candidates themselves are still busy readjusting to the new lineup. While lower-tier candidates have been busy complaining about being relegated to the pre-show debate at the Milwaukee Theater, the top eight Republicans have been taking notes on one another's most recent scandals and poll numbers, in an attempt to weed out rivals that pose the greatest threat. One of those candidates is former HP CEO Carly Fiorina, who desperately needs to break from the pack in a revolutionary way if she's hoping to win — or even stay in the race at all. Fiorina has been on a downward trajectory since cresting in the polls at 15 percent of the prospective vote. A CNN/ORC poll from Sept. 20 showed that, following the second GOP primary debate just days earlier, Fiorina had gained an impressive lead over her rivals, rocketing her to second place behind Donald Trump. Fiorina's luck, however, was fleeting. Since her aggressive showing at the Reagan Presidential Library debate, Fiorina has largely fallen off the radar, at least in comparison to her recent successes. While a CBS/NY Times poll released in late October showed Fiorina with 7 percent of the prospective primary vote, a Quinnipiac poll this week placed the businesswoman at just 3 percent — a significant drop from her previous position. Of course, part of that can be attributed to the ever-shifting dynamic of a presidential primary race. One day it's gold and roses — the next, a hawkish comment from a rival sends them soaring in the headlines and causes your numbers to drop like a stone. Primary voters tend to be a fickle bunch and Fiorina is no longer the flavor of the week. But a good portion of Fiorina's fall has to do with the former CEO's own campaign strategy. Rather than hooking a wider supporter base with a litany of revolutionary ideas, Fiorina failed to make better use of her time at the top, latching instead onto a single issue: the ever-controversial Planned Parenthood debate. And while conservatives initially drummed up as much propaganda as humanly possible concerning Planned Parenthood's government funding, it seems that the voters themselves have grown tired of the scandal and moved on. The GOP leadership may continue to beat the anti-abortion war drums, but the people aren't listening — and what was once a viral social media sensation has slowly devolved into partisan demagoguery. It was that gradual shift which unfortunately killed Fiorina's rise. "[Fiorina's camp] had this moment and in some ways reduced it by not taking a broader, frankly, more presidential focus," Republican strategist Rob Stutzman told CNN in an interview back in October. "They weren't prepared for the moment they fought so hard for." Stutzman was, of course, referring to Fiorina's diatribe against Planned Parenthood at the second GOP debate, in which Fiorina criticized her liberal counterparts for dismissing a series of videos by the anti-abortion Center for Medical Progress, which allegedly showed high-ranking Planned Parenthood staffers discussing a fetal tissue for cash scheme (those claims were later panned by independent reviewers as untrue). "I dare Hillary Clinton, Barack Obama to watch these tapes," Fiorina scolded from the debate stage. "Watch a fully formed fetus on the table, its heart beating, its legs kicking while someone says we have to keep it alive to harvest its brain." Fact checkers later declared that no such video existed, but the voters were more than happy to lap up the controversy regardless — for a short while, at least. 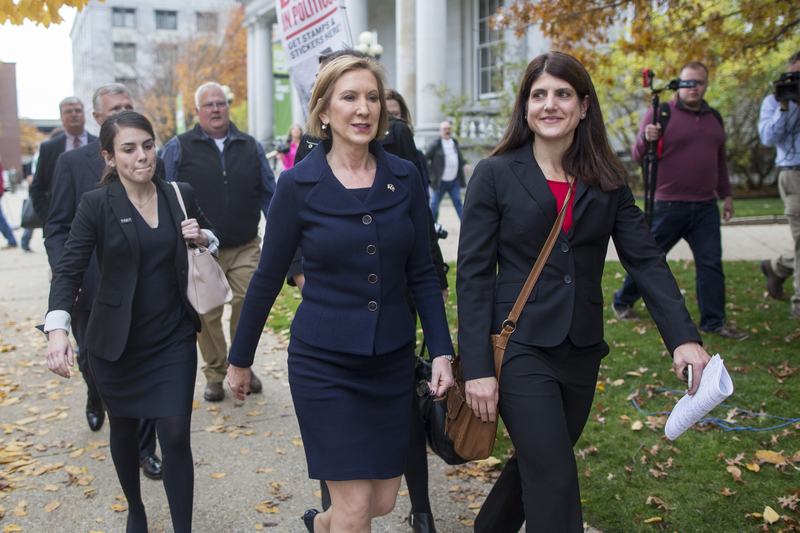 Any pro-life momentum soon fizzled, however, leaving Fiorina scrambling to keep voters interested. It wasn't too long after that Fiorina's rivals Ben Carson, Ted Cruz, and Marco Rubio began to overtake the headlines with scandals and outrageous statements of their own. For all intents and purposes, the Fiorina gilded age was over. If Fiorina wants to regain that lucrative sheen that once gave her a bump in the polls, she needs to take this fourth GOP debate more seriously, and more importantly, from a creative point of view. Touting again and again how much more extreme you are on abortion issues than your rivals only works for a short time before it starts to bore voters. To really cement herself as a primary contender, Fiorina needs to beef up her stances on issues like foreign policy (name-dropping Bibi Netanyahu doesn't count, sorry), at which she's already arguably more knowledgeable than her Republican counterparts, and change out the talking points more often. Playing nice with the others only works for so long, and it's about time Fiorina went on the offensive and started crafting her own headlines to avoid voter exhaustion. "Carson's statements about the Holocaust and gun control, or about the Umpqua massacre, may be derided by some, but they keep his name in the news — and they rile up supporters who see criticism of his remarks as persecution," The Atlantic's David A. Graham wrote in October. "Fiorina pulled something similar off when she insisted she’d seen a video taken at a Planned Parenthood that did not exist, but that moment passed, and she hasn’t created another." Until Fiorina starts dynamically concocting more unique taglines and policy statements — things that the public can really latch onto — she'll continue to lag in the polls. And if that's the case, it won't be long before her team is rigging up the cameras for her dropout announcement.